It is reported that a Berkshire (England) paper mill worker failed to add sizing to a batch of paper that was being produced. The batch was discarded. Subsequently, someone tried to write on a piece of this discarded "scrap" paper and found that it rapidly absorbed any ink applied, making it unusable for writing. 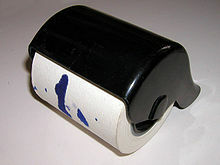 Its marked absorbency having been noted, however, led to its subsequently being produced and used as blotting paper, replacing sand, which was the material that had been used for absorbing superficial wet ink. In a time when most paper was produced from "rags", red/pink rags, from which it was difficult to remove all color and had generally been discarded, were now directed to the production of blotters, hence the historically characteristic pink color of blotters. Drugs active in microgram range, most notably LSD, are commonly distributed on blotting paper. A liquid solution of the drug is applied to the blotting paper, which commonly is perforated into individual doses and artfully decorated with what is known as blotter art. Vanity blotter is blotter art that hasn't been exposed to LSD and is usually sold as a collectible, although inevitably much of this art ends up in illegal distribution. The artwork is printed onto blotter paper and then sometimes perforated into tiny squares or "tabs" which can be torn or cut apart. Most blotter art designs have grid lines as part of the design to either aid in perforation or to be left as a cutting grid. Blotter as a delivery method allows for easy dosing of potent substances and easy sublingual administration of drugs which has made it increasingly popular as a preparation for other potent drugs including 25I-NBOMe and alprazolam. Blotting papers are also commonly used in cosmetics to absorb excess sebum oil from the face. They are popularly marketed and have been sold by numerous cosmetic brands worldwide such as Mac and Bobbi Brown, as well as UK high street store: Boots UK. Prices for blotting papers can range from as low as $3.00 per packet to as high as $30 or more. More affordable brands can be found by makers such as Clean and Clear and pharmacies such as Walgreens or CVS often carry their own brands for a reduced price. The papers are often dyed, for wider market appeal, and dusted with salicylic acid and minerals to actively prevent the formation of comedones and acne. However, there is a popular debate of whether blotting papers can help reduce acne by absorbing excess oil, or cause it. The quality of the blotting papers and the use of other ingredients such as mineral oils may be a determining factor. ^ Doyle, Sir Arthur Conan (1905). "CHAPTER XI: "THE ADVENTURE OF THE MISSING THREE-QUARTER"". The Return of Sherlock Holmes. Lit2Go. London: Georges Newnes, Ltd. Retrieved December 7, 2013.